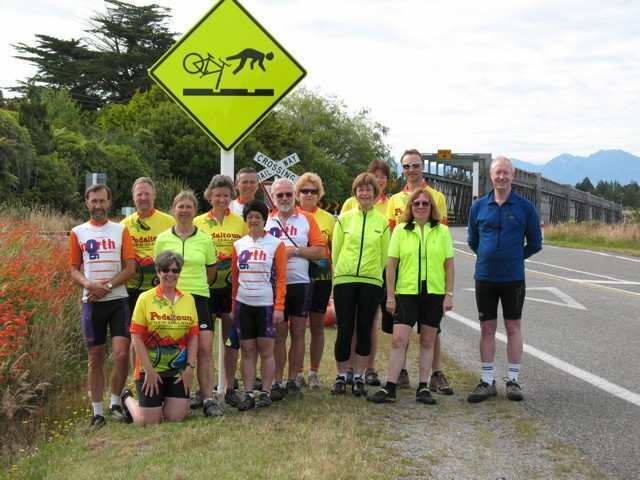 On 27th January 13 Bike North members assembled in Christchurch for a 2 week tour of the South Island. The tour was organised by Alison Wong and Pam and Col Kendrick using Pedaltours, a NZ company specialising in supported bike tours in NZ, Australia and Vietnam. Day 1 started with a briefing meeting with our two guides. Shortly afterwards, we all sat down for lunch. Graeme and Debbie Edwards had brought their own bikes, but the rest of us had arranged to hire bikes from Pedaltours. There was a choice of road or hybrid bikes for hire, and they were pretty good bikes. That afternoon we were issued with our rental bikes, adjusted them to suit ourselves, and went for a test ride in Hagley Park. Then we had a group dinner in a local restaurant. Our transport consisted of a minibus with a double-axle trailer. The trailer carried our bikes (when we were not riding them), our luggage, and a table and food for picnic lunches. When we were riding one of the guides drove the bus while the other rode with us, generally as sweep. We were able to choose how far we rode each day with the bus following to pick up those who wanted a rest. Some of us even chose to be bussed up some of the bigger hills (no names, no pack drill)! Day 2 started with a 2 hour drive from Christchurch to Timaru. We then rode the 64 kms to Fairlie through pleasant rolling farmlands. Accommodation that night was in local farm stays where we were very well looked after. Our farm stay had a number of tame or semitame beasts including alpacas, Wapiti deer, an ostrich and a Highland cow. Day 3 started with a long steady climb up Burkes Pass (elevation 750m). On the other side of the pass the weather turned nasty with very strong and gusty cross and head winds. We were happy to stop for lunch at Tekapo. After lunch the route took us along a hydro canal on a beautifully sealed road with very little traffic. Initially we had the strong wind behind us and we fairly flew along. Later we had a cross wind which threatened to blow us off our bikes. Many of us took to the bus at that point. Accommodation that night was in Twizel in the old construction camp for the hydro scheme which has been converted into a basic motel. Day 4 saw us riding in perfect weather from Twizel to Glentanner for lunch. Most of us then rode in the bus to Mt. Cook Village to avoid a headwind. The exceptions were Graeme Edwards and Peter Tuft who chose to indulge in a little masochism. Some of us went for a short bushwalk before an exhilarating ride back to the main highway with a good tailwind. Accommodation that night was in Omarama. Day 5 started with a long steady climb up the Lindis Pass (elevation 970m), followed by a great descent to Tarras. We were bussed the last section from Cromwell to Queenstown. Day 6 was a rest day in Queenstown where we managed to fit in a wide variety of activities. Peter and Robin Tuft climbed Ben Lomond, Moya and I went for a swim followed by a tour of the local wineries, while most of the rest of the group went up the gondola and had some rides on the luge. Liz Quine went to Milford Sound, and others went on cruise on Lake Wakatipu on the TSS Earnslaw. Day 7 started with a ride from Queenstown to Arrowtown. Then we tackled the biggest climb of the trip on the Crown Range road to Wanaka. This climbs about 700m over about 11kms. Only four riders made it to the top without resorting to the bus. Then followed an exhilarating descent to Cardrona where we relaxed in the garden of the pub before riding on to Wanaka. Day 8 saw us ride from Wanaka to Makarora via the shores of Lakes Hawea and Wanaka, a distance of 66kms. Lunch was a picnic beside Lake Wanaka where we were attacked by hoards of voracious sandflies. That afternoon some of us took a jetboat ride up the Wilkins River into the Mt. Aspiring National Park. It was an exhilarating ride up a spectacular valley. Day 9 covered 80kms from Makarora to Haast Village via the Haast Pass. The climb from the Makarora side of the pass is only about 220m, but the descent after the pass is about 450m. I was glad we were not doing the tour in the opposite direction which is the way �Pedaltours� normally run it. Day 10 was the first of four days of perfect weather on the West coast, an area renowned for its high rainfall. Temperatures rose to 28C most days which made riding in the afternoons a bit too hot for my liking. We had lunch at a salmon farm at the 58km mark. There were 3 steep climbs at the end of the day between Fox Glacier and Franz Joseph Glacier, and most of us quit before them. However they stopped the bus at the top of the last descent into Franz Joseph so we could all enjoy the final descent. Graeme and Peter rode the whole way covering 140kms that day. Accommodation that night was in a backpackers in Franz Joseph. Day 11 was a rest day in Franz Joseph and most of us did the half-day glacier walk with crampons and ice-axes. Day 12 saw us ride part or all of the way from Franz Joseph to Hokitika. Graeme, Peter and John Williams rode the whole way (135kms), while most of us quit at Ross after 108kms. Day 13 saw us drive from Hokitika to Greymouth and ride from Greymouth to Punakaiki (44kms) where we had a look at the blowhole and the pancake rocks. Graeme, Peter and John then rode back to Greymouth while the rest of us did a short bushwalk down the Truman Track to a spectacular beach. On Day 14 we packed up and loaded the bikes onto the trailer just before the rain started to bucket down. We drove out to see the old Brunner mine site (Peter and John rode out). After lunch we boarded the Tranz Alpine train for the trip back to Christchurch. All in all it was a wonderful trip. Moya and I postponed a trip to Antarctica so we could do this trip and we are glad that we did so. �Pedaltours� did a great job and we would be happy to go on other tours with them (and we intend to). The guides were great and it was no trouble for them to stop the bus whenever one of us needed a rest. They also serviced the rental bikes during the rest days and were always ready to adjust things at any time. Some of the accommodation was a bit basic, but as we were getting the trip for about half the normal cost that is perhaps not surprising. As one of the slower riders I covered 754 kms in the 10 days riding with 108 kms as my longest day, but the stronger riders covered much more.